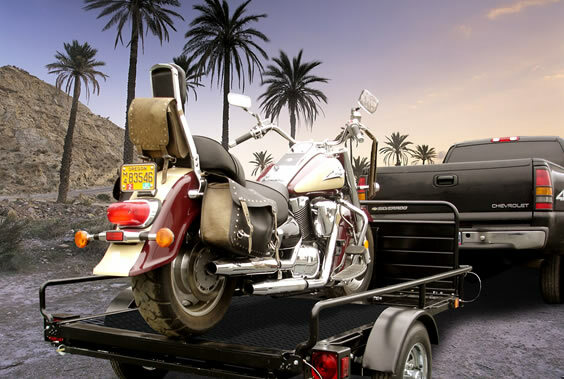 HaulSport™ Trailer Kits are truly "Versatile" when it comes to work or play. Every trailer has an exclusive load bearing front corrugated steel drop gate, which instantly increases the bed length from nearly 8ft. to almost 10 ft when the front is lowered which will accommodate longer loads or carry an optional 48" storage chest. The MC583 HaulSport™ trailer comes with (3) recessed chocks, built in ramp storage below deck, 1,000 lb. 60" loading ramp(s), a payload balancing system, LED lights, 6 ply radials, and custom wheels. Extends your bed length up to 10 ft’. 24" quick release drop gate is load bearing. The drop gate locks position.